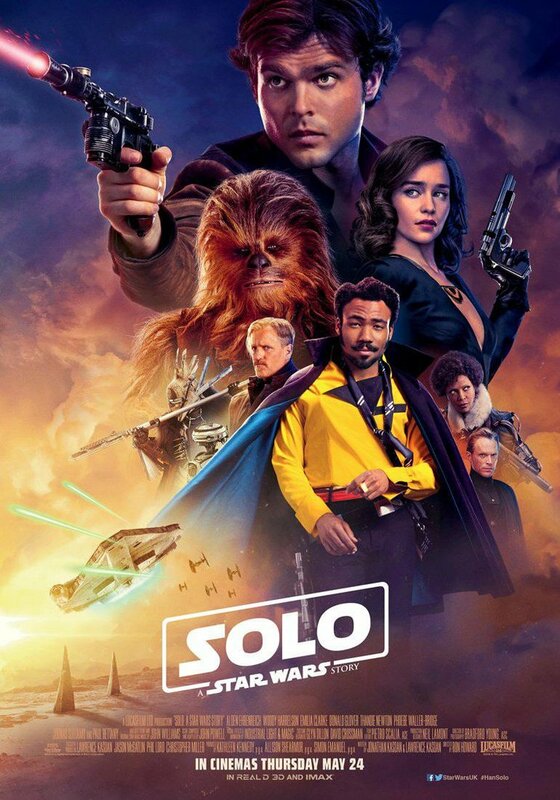 ‘SOLO, A STAR WARS STORY’ is a spinoff from the “Star Wars” franchise and is a prequel showing how Han Solo got his family name and became the hero we’ve seen first as Harrison Ford in the very first Star Wars flick, “A New Hope” in 1977 where he met Luke Skywalker and Princess Leia. This was obviously made to milk and cash in on the popularity of the “Star Wars” series since no one is really demanding or clamoring for an origin movie about a young Han Solo to be made since pretty much everything that we need to know about him was already established in his past appearances in “Star Wars episode 4 to 7”. The young Han is now played by Alden Ehrenreich, who we first saw playing supporting roles as Cate Blanchett’s stepson in “Blue Jasmine” and in other films like “Beautiful Creatures” and “Hail Caesar”. He may not look exactly like Ford but he’s got the right smug mischievous attitude. The film had two different directors when production started but they were eventually replaced by Ron Howard (“Apollo 13”, “A Beautiful Mind”) who now delivers an action-adventure origin story about a young man with big ambitions and how he acquired his famous spaceship, the Millennium Falcon, and his loyal co-pilot, Chewbacca. When we first meet Han in a galaxy farther and farther away, he’s in the mining planet called Corellia and he’s supposed to deliver a hyperfuel called coaxiom to its leader, a talking monster called Lady Proxima who looks like a giant caterpillar. He is held captive but manages to escape with his ladylove, Qira (Emilia Clarke of “Game of Thrones”). They intend to join the Imperial Army but Han is the only who gets passed the immigration gates while Qira is detained. Han wants to be a pilot but he becomes an ordinary soldier in a planet full of mud. He plans to return to Corellia to get Qira back. They join forces to steal a shipment of coaxiom on board a train that travels on an elevated railroad track that twists around dangerous mountain passes. This is a thrillingly executed action sequence, especially when a gang called Marauders suddenly appear to steal the goods from them. Only Han, Chewy and Beckett come out alive and they’re beholden to Dryden (Paul Bettany), the head of a syndicate called Crimson Dawn. On board Dryden’s space craft, Han is reunited with Qira, who now works for Crimson Dawn. They hatch a plan to get the coaxiom in its raw form that they will steel from the planet Savareen. This leads to more action scenes with some double crossing characters getting the comeuppance they so deserve. What’s nice is the character arc of Solo as he becomes more politically aware about the true colors of some his supposed friends and Alden serves his role quite well with a charismatic presence and a spirited performance. Emilia gives great support as Qira, who keeps us guessing about her true color. Is she friend or foe? 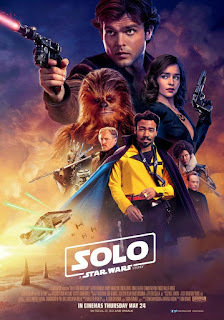 Also giving fine support are Woody as the double-dealing Beckett, Bettany as the shrewd and duplicitous syndicate boss, and Donald Glover as the card shark Lando Carlrissian, the cunning original owner of the Millennium Falcon who tries to cheat Han but who turns out to be more astute than him. The script written by Lawrencre and Jonathan Kasdan manage to properly balance action scenes with rivetting character development, supplying details like how Han got solo as his surname and the lucky charm gold dice on the Falcon’s windshield. Original Star Wars fans won’t be disappointed. The musical score by John Powell even manages to incorporate the original Star Wars and Han Solo theme which we hear at key moments. Alden Ehrenreich signed up for three “Solo” movies, but this first one didn’t do as well as expected. The prediction is it will earn $130 million on opening week but it only raked in $80 million, so we don’t know if they’d still go on with the other planned two movies. Maybe audiences are already tired of the “Star Wars” franchise.